Mouse kidneys are located on the upper wall of the abdominal cavity and are held in place by fibrous capsules. 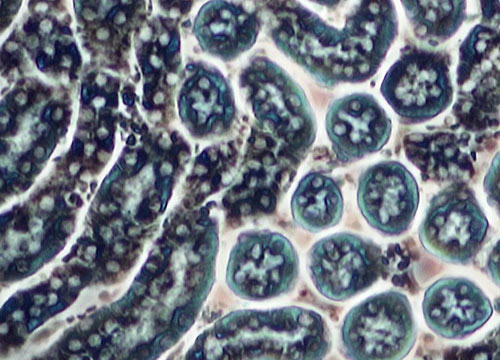 Similar to other mammalian kidneys, mouse kidneys appear bean shaped, brownish red, granular, and have a firm consistency. The outer region of the kidney is termed the cortex and the inner area is known as the medulla. Tiny structures called nephrons, which consist of even smaller and more intricate elements, stretch across both sections. The nephrons are the functional units of the kidneys, responsible for filtering blood, reabsorbing water and nutrients, and secreting wastes. Mouse kidneys are located on the upper wall of the abdominal cavity and are held in place by fibrous capsules. Similar to other mammalian kidneys, mouse kidneys appear bean shaped, brownish red, granular, and have a firm consistency. The outer region of the kidney is termed the cortex and the inner area is known as the medulla. 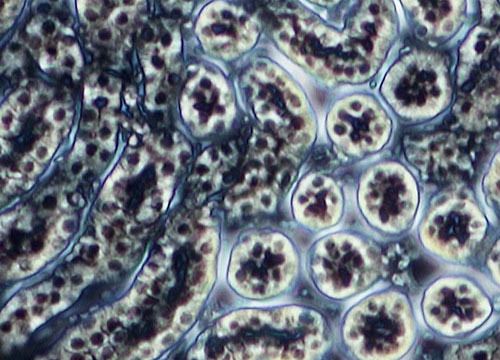 Tiny structures callednephrons, which consist of even smaller and more intricate elements, stretch across both sections. The nephrons are the functional units of the kidneys, responsible for filtering blood, reabsorbing water and nutrients, and secreting wastes. The similarity of mouse kidneys to human kidneys makes them extremely useful in scientific studies. For instance, researchers have gained a much better understanding of one of the most common forms of kidney disease by using genetically engineered mice as models for the disease. Affecting millions of people worldwide, IgA nephropathy, or Berger's disease, is a condition in which the kidneys cease to filter properly. The disease traditionally results in the need for dialysis or organ transplant. Thanks to researchers and their experimental mice, however, a far more convenient and safe option may soon be available.